This is a short biography on the hero of American Revolution who subsequently defected to the British side thereby becoming one of the most hated figures in American history; Benedict Arnold. The book starts with his Puritan upbringing and how he developed a subsequent hatred towards the British, the duel he had with a certain British General and his heroic fight against the British at Quebec, by which he got noticed by George Washington very quickly. The book then moves on to his disgruntlement over being denied promotion to Brigadier General; and his subsequent defection to the British wherein it was alleged that his loyalist in-laws were influential in this decision. The book covered all aspects of a highly controversial figure, his early life, how he developed hatred towards the British, his early achievements in the military. It also brought out his personality as someone who looked at ends more than means, wherein, he willingly readmitted a defector (who should’ve been tried for treason) who offered to fight along his side. The book also brought out the extent of influence brought in by his in-laws well, the meetings he had with British generals, etc. 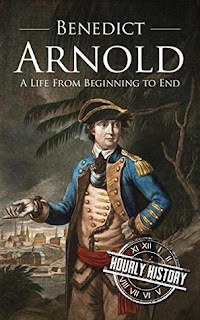 What I felt was that the book covered his British life very little; his conquests for the British was barely touched upon and his eventual exile to London was skipped, with only a bare mention that he died in 1801 in London. The book was short and conveyed the information that was required, for a short read. Considering the same, I would award the book a rating of six.